Savannah, Georgia, is the oldest city in the United States, and it offers its visitors beauty, charm, and southern hospitality. If your group has selected Savannah as its destination of choice, then you will need excellent planning skills and the best insider tips in order to get the most out of your visit to Savannah. Even if you have several days to discover the sights and history of Savannah, you will feel as if there are still hundreds of little gems left uncovered. We asked our group-travel experts to give us their top-five list of awesome places to visit. Take note, and let us help you make the best of your trip to Savannah. Don’t miss River Street: River Street offers a huge variety of dining and shopping options, with tremendous southern charm. Additionally, it is home to numerous festivals including Bacon Fest, Christmas on the River, and First Friday Fireworks. 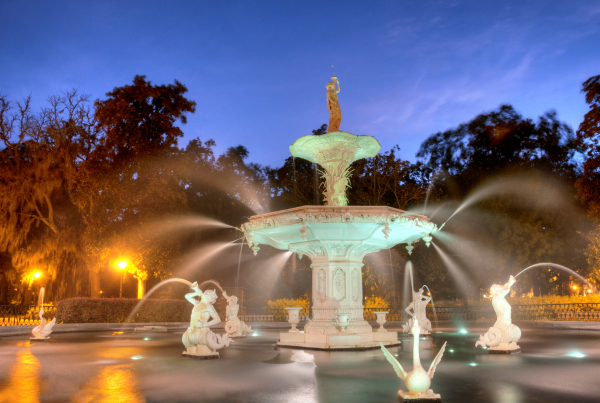 Forsyth Park: This 30-acre park is architectonically and botanically impressive. Built in 1840, Forsyth Park is home to majestic trees covered with Spanish moss and a fragrant park for the blind. During spring or fall, the park provides a wonderful backdrop for pictures. Old Town Trolley Tours: A great way to start a stay in Savannah, the Trolley Tours will take your group on a visit of the old city. This is a wonderful way to become familiar with Savannah, for senior citizens or those with limited mobility. Historic Savannah Theatre: The Savannah Theatre opened its doors in 1818, and it has provided excellent, family-friendly entertainment since. The building is beautiful, the ambiance magnificent, and the shows are absolutely memorable. Group rates are available for groups over 15 guests. The Paris Market: This store is magical. A lovely two-story home with everything Paris you ever dreamt of having, without ever having to cross the Atlantic. A great stop for groups interested in design and European-style home décor. We are always on the lookout for great places to visit and high-quality group hotels to make your group trip a total success. We can’t wait to share with you more of what Savannah has to offer.